Following on from part 1 of our historical examination of Valentine's Day, in today's blog we will be taking a more in-depth look at the 19th century right up to the modern day. By the end of the 18th century, reduced postal rates led to an increase in mailed Valentine's card. Prior to this, Valentine's cards were delivered personally. This turn of events also meant that people could now send Valentine's anonymously which in turn encouraged more titillating or lively content within the cards themselves. Such content was generally repressed in the modest Victorian era. Before the advent of mass publishing, would-be Romeos would have to rely on their own creative wit to write romantic verse into the cards they sent their Valentines. The imagination boggles when we attempt to consider some of the content they might have come up with. This all changed in 1797 when a publisher in the UK released The Young Man's Valentine Writer which offered numerous verses for those with both a crush and a writing block. Printers also began making what were then deemed 'Mechanical Valentines,' with verses already inside for those unable to express their own sentiments. By the early 19th century, Paper Valentines were proving so popular in England that they were being mass produced in factories. This era also saw the advent of Fancy Valentines, premium affairs made with real lace and ribbons for those who really wanted to make an impression on the object of their affections. By the second part of the 20th century, the tradition of sending Valentine's cards escalated into the holiday it is nowadays, where all manner of gifts are sent, from the simple and modest to the elaborate and attention-grabbing. Popular gifts began to include chocolates as well as, of course, Valentine's Day Flowers. By the 1980s even diamond manufacturers were trying to get in on the action, using the holiday as an excuse to promote and market the sale of jewellery. The advent of widespread internet usage has again modified our customs and habits for February the 14th. 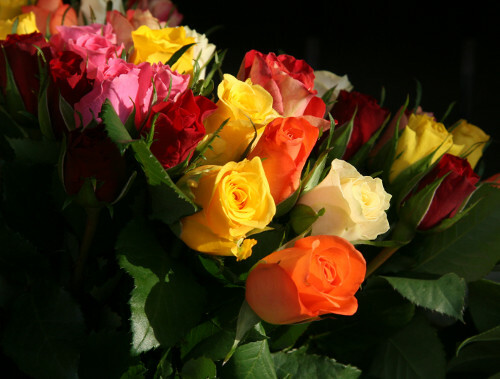 Valentine's gifts such as flowers can now be ordered online. Digital e-cards are also beginning to compete with their paper counterparts; it's estimated that around 15 million e-valentines went out in 2010. Despite this, it's extremely unlikely that handwritten cards will be phased out just yet, owing to their special personal touch. From its roots in Christian martyrdom to its present day incarnation as what some to be an overly commericalised occasion, there is no denying that Valentine's Day still has a huge presence and impact around the world. Some may approach the day with religious solemnity, others with a anti-capitlist disdain but the most important thing to remember is that Valentine's Day is all about love. How you choose to express your love, whether you are in a relationship or are hoping to win the affections of a crush, is largely up to you. Whether it's with a bouquet of fresh red roses or with (gasp) a gold diamond ring, the important thing is the gesture itself which shows that you took the time to think of someone and express just how much they mean to you.